Diagrams C.35, C.36 and C.37 show inconsistent allocation between the displayed items, yet the text would seem to imply that they're supposed to show the same relationships. In C.35, the allocation is from an ObjectNode symbol called "DriveCurrent" (which I believe equates to an ObjectFlow - name unknown) to an ItemFlow called "i1". In C.36, the allocation is from an ObjectNode called "DriveCurrent" to a Connector (name unknown). In C.37, the allocation is from an ObjectFlow called "o6" to a Connector called "epc-emg.1". 1. ObjectNode is an abstract specialization of ActivityNode and as such you can't have any instances of them in a model. Any reference to an ObjectNode should be removed. 2. The allocation should consistently be from ObjectFlow "o6" to either ItemFlow "i1" or Connector "epc-emg.1". 3. 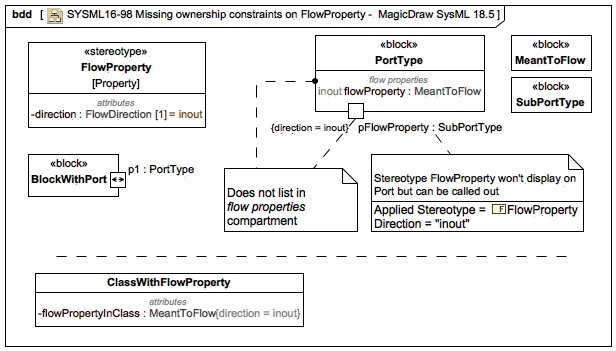 In order to make it clear that the same items are being related, the names of the ObjectFlow and the Connector/ItemFlow should be shown on all diagrams. 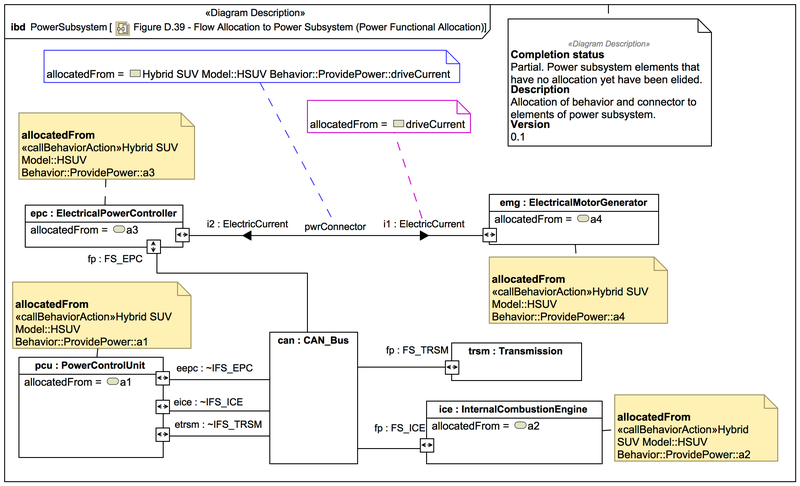 Currently the ObjectFlow and the Connector names are not shown. Since it's unclear what is being allocated, it would make more sense to show the Pins on the diagram and link the callout note to the relevant item(s) (I believe it's supposed to go to the ObjectFlow). is not used for the ControlValue enumeration. It should be named ControlValueKind. In SysML today requirements can be represented in a model only in a textual form. Being textually based these requirements often introduce ambiguity, are often redundant with other model element properties, and lack a formally making it difficult to leverage directly in parametric and other analysis efforts. This issue suggests an alternative means of representing requirement in the model environment without using a pure text string. The alternative means is referred to as Property Based Requirement (PBR). PBR defines a requirement mathematically and defines a set of requirement properties. The goal is declare other types of model elements as requirements and apply these properties to those model elements. The allocate and requirements relationships (e.g., satisfy, verify, derive) do not explicitly state the degree to which these relationships apply. For example, a satisfy relationship may imply a model element may fully satisfy, partially satisfy, or not satisfy at all a particular requirement at a point in the design process. However, there is no standard way to refer to this partial vs complete satisfaction. A similar issue applies to the verify and derive relationships. Note: Similar issues apply to allocate relationships where the allocate may indicate that the element is fully or partially allocated to another element. The SysML spec should consider incorporating a tagged value to indicate 0, partial or complete on these relationships. Multiple InstanceSpecifications can describe overlapping sets of instances, and some application need to specify whether the sets overlap. For InstanceSpecifications that specify exactly one instance, this indicates whether they describe the same instance, like the sameAs stereotype in the Ontology Definition Metamodel. InstanceSpecifications describe sets of instances, including the empty set, but some applications need to describe exactly one instance. SysML should have InstanceSpecifications that are constrained to describe exactly one instance, like the owlIndividual stereotype in the Ontology Definition Metamodel. There's a few issues with the Copy relationship as described in the specification. 1. It's unclear what constraint 3 means. What are subrequirements (nested or derived)? 2. How do you match subrequirements in the slave to subrequirements in the master? 3. There's no constraint on the number of Copy relationships that a slave Requirement can be involved in (e.g. one Requirement could be the slave of two different master Requirements). What happens to the "text" tag if there are multiple masters? 4. There's no constraint stopping a Requirement from being directly or indirectly a master of itself. Shouldn't there be? In Allocations, the Diagram Element table is missing the notation for allocated object nodes shown in Figure 15.7 (Example of flow allocation from ObjectNode to FlowProperty). The clause Allocations, Usage Example, Tabular Representation is in the normative part of the spec, but refers to a tabular notation in Annex C, which isn't normative. Is the tabular notation normative? Figure 15.8 (Example of Structural Allocation) is an ibd, but has blocks instead of parts in it. Is it supposed to be a bdd? Ports stereotyped as FullPort can currently be typed by anything a normal Port can be typed by. This isn't the intent of the specification, so constraints should be added. There is a contradiction in the SysML spec. regarding whether constraint parameters-as properties of constraint blocks-may use the derived indicator, "/". Pg. 84 of the spec. clearly states the original intent of the SysML Development Team with respect to constraint blocks: "The block constraints are non-causal and do not specify the dependent or independent variables. The specific dependent and independent variables are often defined by the initial conditions, and left to the computational engine." On pg. 86, however, the spec. states textually that constraint parameters are properties of constraint blocks: "All properties of a constraint block are constraint parameters, with the exception of constraint properties that hold internally nested usages of other constraint blocks." There is no metamodel fragment in the spec. that shows that the stereotype SysML::ConstraintParameter extends the metaclass UML4SysML::Property. The text on pg. 86 (quoted above) conveys this. As a result of this (implied) extension relationship, we would have to conclude that a constraint parameter could use the derived indicator, "/", to convey that it is a dependent variable in the constraint expression. This stands in contradiction, however, to the intended non-causal, non-directional nature of constraint blocks as expressed on pg. 84. 1) Add a metamodel fragment to the spec. that clearly shows the extension relationship from SysML::ConstraintParameter to UML4SysML::Property. 2) Add a constraint to the SysML::ConstraintParameter stereotype disallowing the use of the derived indicator, "/", on constraint parameters. The specification allows property-specific types and property-specific initial values. Ports are just a special kind of property. Thus it would be possible to model port-specific types and values. The only problem is, that it is not possible to show the specifics of these types or the initial values within an internal block diagram, as would be the case for a property. A callout notation can be used in an ibd for ports with a port-specific type or initial value. It shows the same information as the compartments for properties. Maybe this notation could also be used on block definition diagrams, and in this case for properties as well. Then there should be a sentence in chapter 8.1.1.1 and an example in Table 8.2. Libraries package should be named "SysML Model Libraries"
The spec headings refer to model libraries using the adjective "model", so the package name should include it also. The name should start with "SysML" since it is separate from the SysML package.